Common ingredients — chocolate, butter, bananas, pecans — that yield uncommon results. You may drool with The Amen Lefse Wrap, so grab a napkin. Of course, if your day is dominated by don’ts, don’t read on. 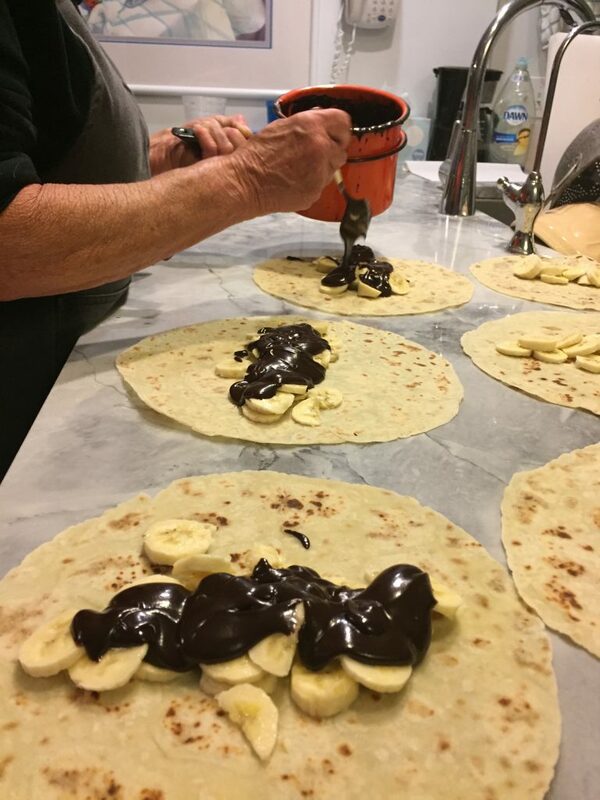 That is, if you don’t like chocolate and butter and bananas and pecans — and if you don’t want to adulterate your lefse with anything but the standard butter and sugar — then stop right here. No need to check out this recipe for making a Super Bowl party lefse wrap that will be snapped up before the New England Patriots or Los Angeles Rams score a point. On the other hand, if you do like fudge — homemade fudge — and if you do like bringing a bit of drooling adventure to Lefseland, then by all means do make The Amen Lefse Wrap and bring it to Sunday’s party. Or … make it and eat all by yourself. To prepare fudge sauce: Melt chocolate and butter in a double boiler. Stir in sugar, cocoa, and cream. Cook over low heat for 15 to 20 minutes, stirring occasionally until smooth. Set aside. Slice bananas and spread in a line on the diameter of 4 lefse rounds. Drizzle generously with fudge sauce, and sprinkle with pecans. Roll burrito-style. Previous post: Lefse Wraps for Super Bowl Parties!